Can you believe it’s been 2 months already? I can’t! We’ve definitely come a long way in the last 2 months! This is going to be a short post because it’s 10:00 and I just got home from the hospital and I’m tired. But I couldn’t miss this important date! Mason – 4 lbs. 13 oz. Logan – 5 lbs. 3 oz. 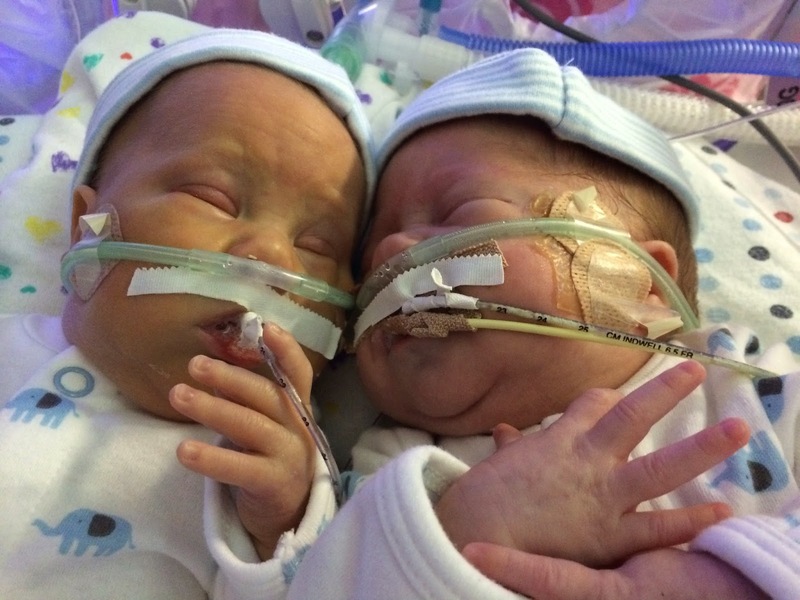 They’ve almost gotten too big for preemie clothes! I can’t believe it! Logan and James fill them out already. Mason is the little guy so he still has some room. But it’s almost time to start putting them in newborn size clothes! They seem so big! Mason has become a whole new baby in the last month. He went from the sickest to the most well off in a very short time. That’s right, Mason is in the lead right now (don’t tell James). 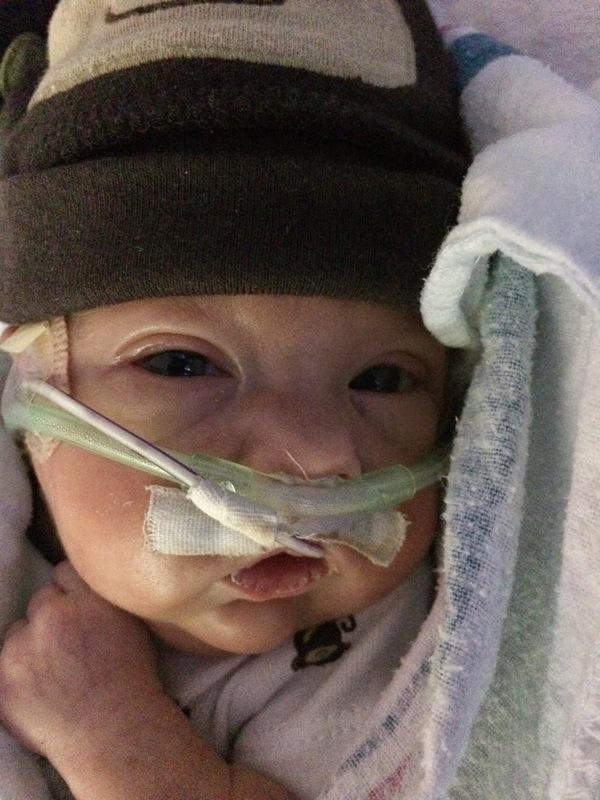 Last month Mason was on the jet ventilator, he was puffy, and he was just sad (for me). Today, Mason is on a straight oxygen nasal cannula, he’s unpuffed (that’s a medical term in case you were wondering), and he’s just overall doing very well. He’s doing occupational therapy and speech therapy to work on his sucking reflex so he can start learning to eat soon. And he’s doing great. Mason is the most alert of the three boys. The other day he had his eyes open and was looking around for an hour straight! He’s a big boy (but the smallest triplet). Logan has also become a whole new baby in the last month. In the last month he has been on the jet ventilator, had a chest tube, been on lots of sedation (morphine and versed), has been put in isolation for an infection scare, and has had to restart his feeds because of a belly infection scare. 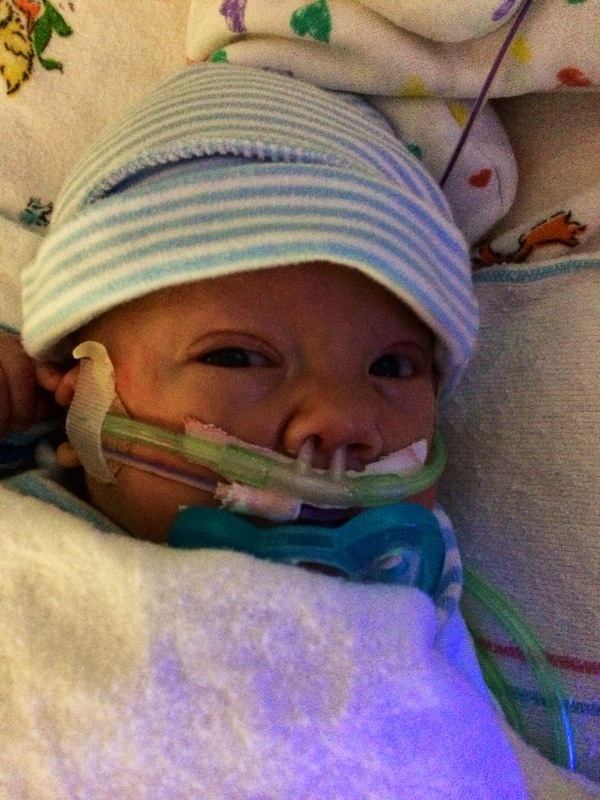 Today, Logan is off the ventilator (yay! 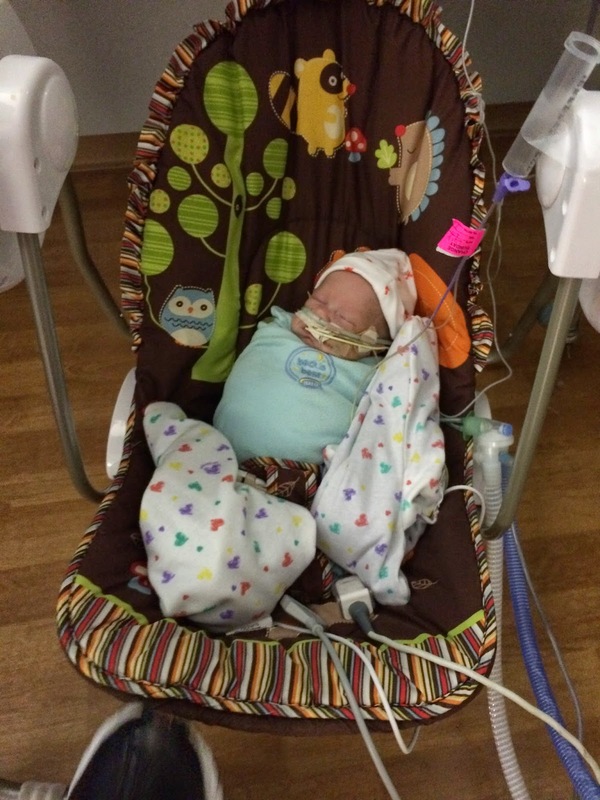 ), he’s in a bassinet wearing clothes like his brothers, and he’s doing great! He’s also off his morphine and versed drips. He’s having some withdrawals but overall he’s doing great! 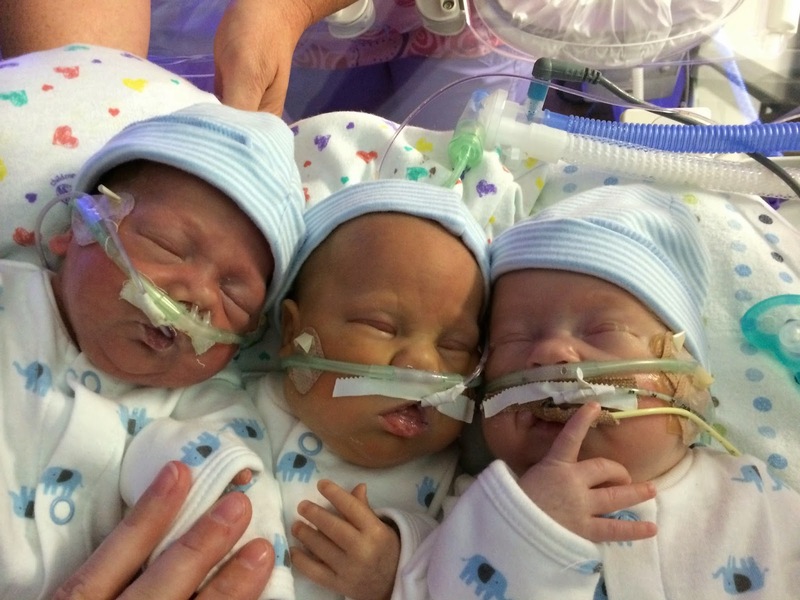 He’s actually doing better than his brothers did when they first got off the ventilator. Yay Logan! I don’t even know where to start with Mr. James. He’s a mess. But he’s also doing really well. 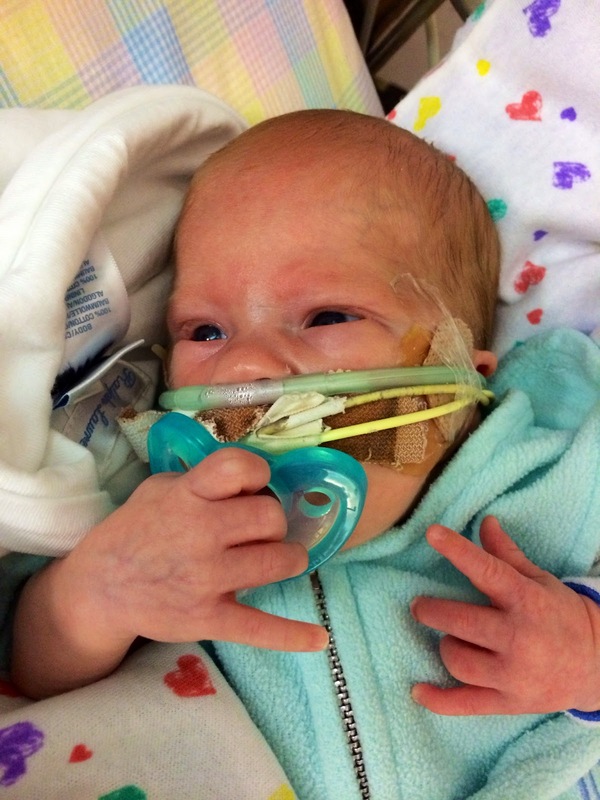 In the last month, James has gotten off the ventilator, into a bassinet, and started wearing real clothes first. He also has the biggest attitude so far! He looks like his daddy to me, so maybe that’s where he gets it. We’ll go with that. Like Mason, James is also getting occupational and speech therapy to start working on sucking so he can eat eventually. His reflux has gotten better at this point too! James also got to swing this week for the first time. He wasn’t too impressed. But look how tiny he is! Also, we caught this sweet moment between Logan and James when we were getting all 3 boys together for their first triplet photo (at the top in case you missed it). So sweet! They really love each other. Maybe they remember each other? I’m not sure, but James was crying then when we put him next to Logan he stopped. I’ll post my weekly update on Tuesday of course for Week 9. Thanks so much for all of the prayers, good positive thoughts, and everything else. I truly believe that it’s working! These boys are so loved by everyone and it means the world to me!